9 a.m. to 3 p.m. Monday – Friday, June 24-28..
9 a.m. to 3 p.m. Monday – Friday, July 29 – August 2. For ages 6-17. Includes instruction, snacks and lunch. Cost is $250. 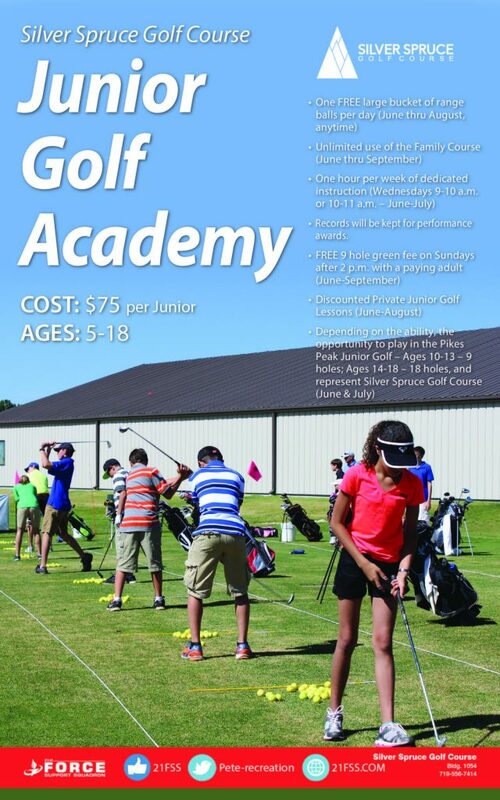 The Silver Spruce Golf Academy is proud to offer Junior Golf Camps. The golf camps will be five six-hour classes based on the PGA Sports Academy program. This series allows instructors more time with students to perfect golf techniques – from the short game to smashing long drives. Each six-hour session will cover a specific area of the game and will provide in-depth discussion and demonstrations, plus on-course execution. These camps are designed with serious game improvement in mind. The fee includes lunch and beverages throughout the day and, of course, first-rate golf instruction. One hour per week of dedicated instruction (9-10 a.m. or 10-11 a.m. Wednesdays, June – July). Depending on the ability, the opportunity to pay in the Pikes Peak Junior Golf League: 9 holes for ages 10-13 and 18 holes for ages 14-18 and to represent Silver Spruce Golf Course (June & July). If you have questions, please call the Pro Shop at 719-556-7414. Didn’t work on your swing over the winter? Visit us at the Silver Spruce Golf Academy, and we can have you ready for golf season. The Silver Spruce Golf Academy is a full-service game improvement facility. Our practice facility features a private indoor and outdoor practice area, a putting and chipping green, practice bunkers, and the finest diagnostic technologies. Your personal instruction with us is complemented by the latest teaching technologies, including V1 video analysis. Silver Spruce Golf Academy has been designed with a variety of enhancements to create the perfect environment for improving your game while incorporating the natural beauty of the surrounding Rocky Mountains. Golfers will love the challenging 18-hole championship course with its striking scenery and excellent course conditions. For details, call the Pro Shop at 719-556-7414. Give the gift of golf lessons with a convenient gift certificate. Call 719-556-7414 or 719-556-4558 for details. 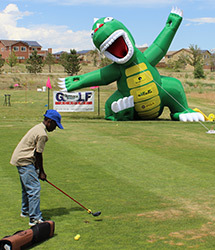 The Silver Spruce Golf Academy, located at Peterson Air Force Base, offers an exceptional instruction facility nestled against the backdrop of the Rocky Mountains. The Silver Spruce Golf Academy is a full-service game improvement facility. Our practice facility features a private indoor and outdoor practice area, a putting and chipping green, practice bunkers and the finest diagnostic technologies. The Silver Spruce Golf Academy has been designed with a variety of enhancements to create the perfect environment for improving your game while incorporating the natural beauty of the surrounding Rocky Mountains. Golfers will love the challenging 18-hole championship course with its striking scenery and excellent course conditions. Your personal instruction at the Silver Spruce Golf Academy is complemented by the latest teaching technologies, including V1 video analysis and Dynamic Balance System. This collection of technology is one of the most impressive in the world and each is positioned to enhance the level of play for any golfer. V1 video analysis allows our instruction staff to diagnose your swing from multiple camera angles, as well as compare and contrast your swing mechanics on a split screen with many of the best golfers in the world. Each instructional experience will be recorded with instructional voice-overs and either copied to a CD or sent to your own personal e-mail or to your YouTube, Facebook and Twitter pages. These resources are great for long term progression and provide inspiration after you leave the academy. Each of our Silver Spruce Golf Academy instructors is a carefully selected career teaching professional who shares a refreshing, effective and proven approach to the art of successful golf instruction. Help you develop a game plan that will lead to more confidence on the golf course. This game plan will focus on the specific areas of improvement, whether it’s full swing, short game or on-course instruction. Whether it’s adding more distance to your drives, improving accuracy of approach shots or saving shots around the greens, we can help. Use the latest and greatest in golf technology. These tools will enhance the learning environment and provide all of the necessary data to improve anyone’s game. When combining the world of visual learning with the appropriate auditory and feel, each educational experience will be maximized. Teach you the ball flight laws so you will be able to recognize your own swing flaws as they occur and make the necessary corrections. An individualized practice routine will be established so you can focus on how you can improve your swing fundamentals after returning home. Enhance your short game feel by teaching you the time-tested mechanics that will allow you to master putting, chipping, pitching and bunker play, as well as some specialty short game shots which, together, represent the majority of the game’s shots and the fastest route to lowering your scores. Help you develop a pre-shot routine that establishes a solid foundation for consistent and accurate execution on every type of shot you will face on the course. A solid pre-shot routine will help the transition from the practice facility to the golf course. Help you blend the improvements of your swing technique with the proper club-fitting. Blending the instruction and the club-fitting together will allow for any player to be custom fitted for long-term progression.